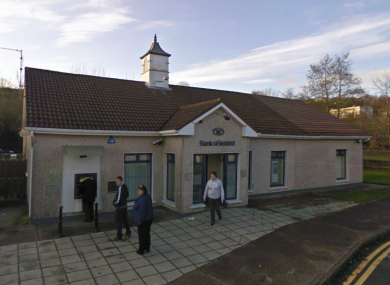 The Bank of Ireland branch in Glanmire, where this morning's attempted raid occurred. TWO ARMED MEN attempted to raid a Securicor van in Glanmire, County Cork this morning. The incident took place at 10:20am when the van arrived to deliver cash to the Bank of Ireland at the Hazelwood Centre, to the west of the town. The men were armed with a sawn-off shotgun and a sledgehammer, and both were wearing balaclavas. The man armed with the sledgehammer entered the premises, but was followed by one of the Securicor staff who was able to tackle and disarm him. The man escaped the building and the two fled empty-handed. They made their getaway in a blue Ford Mondeo car which was later found burnt out at Windsor Hill around two miles away. Gardaí in Glanmire have asked anyone who noticed any unusual activity in the area, or at Windsor Hill, to contact them at (021) 4908530. Email “Security staff foil attempted robbery at County Cork bank”. Feedback on “Security staff foil attempted robbery at County Cork bank”.